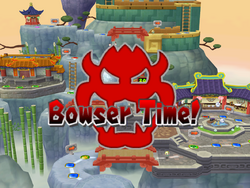 Bowser Time is an event in the game Mario Party 7, occurring every five turns. It only happens in the Party Cruise mode. The gauge always starts at 0% when the game begins and each turn, after every minigame, the gauge will increase by 20%. The process repeats until the gauge is full, at which Bowser will show up, do something that hinders a player or group of players, and the gauge resets itself at 0%. When the game winds down to its last four turns, the gauge does not appear or fill up. Depending on the number of turns in a match, Bowser Time may occur only once, or up to nine times. The gauge on the screen is Bowser's symbol. Bowser can perform any number of events on different boards. On all the boards except Bowser's Enchanted Inferno, one of the things Bowser can do is take a picture of the players, and make them pay 10 to 20 coins for it. Occasionally, Bowser "stumbles into" the photo, but this does not affect the cost at all. Either way, Bowser then leaves without giving the players their photograph, which Toadsworth points out to the dejected group. On Grand Canal, Pagoda Peak, and Pyramid Park, he may take over one of the two Orb Shops on the boards until a player passes by, forcibly selling either a Golden Bowser Statue or a Koopa Kid Orb to them for an unfair price. Afterward, Koopa Kid then takes whatever the player was forced to purchase; if it was a Koopa Kid Orb, he will throw it onto a random space. If a player approaches Bowser's shop and does not have any coins, Bowser will give the player 10 coins. He will not leave if he does this. Bowser will only leave after someone has purchased one of the two items he sells. He can destroy the bridges on the board and build his own bridges with three Bowser Spaces on them, which remain for three turns before becoming normal again. He might slam the mountain, making the players fall down a few spaces. He might destroy a bridge for one turn so a player has to cut their turn short if they reach it. He might destroy the bridges spanning the two sides of the board, making players stay on one side or the other for three turns. This also destroys the Orb Shops for three turns since they are located on the bridges. If any players are on the bridges, they are sent back to the start. He might take a Star from the player in first place and give it to Koopa Kid, who is somewhere on the board. This Star can then be taken by any player using a Chain Chomp, but Koopa Kid periodically moves his location (like how Bandit does in the Solo Cruise). He might steal coins from all the players and put them in the chest which contains twenty coins. He might steal a Star from the player in first and put it in the chest which is containing a Star. Therefore one of the chests contains 2 Stars. He might put a Dark Star in a chest. This replaces the Bob-omb until the Dark Star is obtained. He might destroy a windmill (thus erasing any coins the players had invested in it) and build a new "blank" one without any coins. He might send Koopa Kid to rob one of the windmills. He always sinks the island with the Star and, with the exception of the first Bowser Time, raises the island that was sunk before it. Players on the sunken island are sent back to the start and lose half of their coins. In later Mario Party games, such as Mario Party DS and Mario Party 9, landing on a Bowser Space triggers an event called "Bowser Time" but, it is more similar to the usual effects of a Bowser Space than the special event from Mario Party 7. This page was last edited on February 18, 2019, at 21:00.